Detail the import methodology in Romania. How to import to Romania? What are the import procedures in Romania to move goods? Explain about import registration process, cargo movement to Romania from overseas countries, Import delivery process in Romania etc. 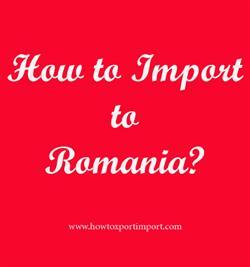 This post explains about step by step procedures that need to be finished with Romania government authority for importation to Romania. Every legal person who has registered with Tax Authority of Romania can start appropriate business and engage with international trade by fulfilling necessary requirements by the Government of Romania. For commercial purpose, a registered trade with concerned license (if required) as per the business and have enlisted in the Trade and Company Register of the country is must for exporting and importing of goods from and into Romania. Romania is a member state of European Union. So the member nations have uniformity in business operations. Since Romania falls under EU countries, a common trade policy is adopted to import/export most of the products . A separate rules and regulations are applied to specific products when importing and exporting in the European Union called Integrated Tariff of the European Communities (TARIC code). For any import, export or transit in EU countries, an EORI number is compulsory. EORI means Economic Operator Registration and Identification. The European Union (EU) legislation has required all member states to adopt the Economic Operators Registration and Identification (EORI) scheme. All importers, exporters and other transporters need to use a unique EORI reference number in all electronic communications with Customs and other government agencies involved in the international trade. This means that anyone involved with export, transit or import operations need to have EORI number. The Operators are required to fill out an Entry Summary Declaration (ENS) to the customs of the country of entry, prior to the goods are brought into the customs territory of the Union, using the electronic procedure (Union Customs Code - UCC).The Union Customs Code (UCC) is part of the modernisation of customs and serves as the new framework regulation on the rules and procedures for customs throughout the EU. National Customs Authority (Autoritatea Na?ionala a Vamilor) that works under the National Agency for Fiscal Administration (Agen?ia Na?ionala de Administrare Fiscala, ANAF) subordinated to the Ministry of Finance is the authority who is in the mission of protecting economic security of the Romania, execution of all the decrees issued by the country’s ministries and governmental institutions which concerned, levies taxes and facilitating genuine trade. The importer can likewise declare the goods by presenting a finished Single Administrative Document (SAD form) to Romania Customs. The official model for written declarations to customs is the Single Administrative Document (SAD). The SAD delineates products and their movement around the world and is fundamental for trade outside the EU, or of non-EU merchandise. Merchandise brought into the EU customs area is, from the time of their entrance, subject to customs supervision until customs formalities are finished. Items are secured by a Summary Declaration which is documented once the things have been shown to customs authorities. The documentation may also vary depending on the country of origin or destination. Understanding the right documents is essential for smooth import and export procedures. The efficiency of the Customs Clearance process is depend on having the valid documents, the accuracy of the information provided in the documents as well as the promptness in submitting the documents and filing the necessary applications for the Customs Clearance. Any delay in filing or absence of documents can delay the clearance process and thereby importer supposed incur demurrage on the imported cargo. This post explains about different phases in import process that every importer needs to go through in Romania. Import registration procedures required in Bucharest. Import Licence process in Cluj-Napoca. Process to import to Constan?a. Requirements of registration to import to Ia?i. Registration requirements in Oradea to import. Registration needed to import to Sibiu. How to get import customs permission in Cluj-Napoca. Explain to import to Constan?a. Information to import to Ia?i. Step by step process to import to Oradea. Methods to import to Sibiu. Guidelines to import to Timi?oara Please guide to import to CONSTANZA. Procedures required to import to Bucharest. Requirements to import to Cluj-Napoca. Clarifications to import to Constan?a. Procedure to get customs clearance to import in Constan?a. Mandatory process need to complete import in Ia?i.The way to get customs clearance process to import in Bucharest .Import documentation in Bucharest port customs. What are the documents required to import in Cluj-Napoca. What are the import document processes need to carried out with Constan?a customs. Required documents to import in Ia?i port. How to Import to Spain? How to Import to Uzbekistan? How to decide export price?